« Upcoming Trip – Something to Look Forward To! While shopping at the local grocery store, I found this little hand pump system and thought it was worth a try. I like its portability. Sure, I have a cool electric machine but had run out of the bags needed, not to mention did not want to have to fuss with carrying it in the van. For this camper, it’s a great solution when: saving casserole portions, storing cookies, aging steaks, you name it! so “real men don’t eat quiche” but do tomcats? Yes. This afternoon I made some quiches in anticipation of the coming week’s camping trip. Quiche is a great any time food and I thought it would help to seal a few in plastic bags and microwave them. 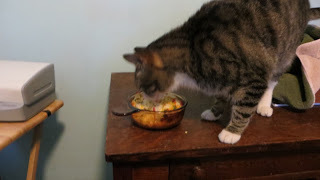 By the way, the link for the crab and onion quiche is on the recipe blog or click here: Quiche recipe. I froze two of the little quiches for a couple hours “naked” and then later sealed them with the vacuum pump and bag. It worked perfectly. Some who have reviewed this little manual system have complained about leaking bag seals but some of the folks were packaging coffee – an item that gases naturally. Another thought is to cool the food before putting it in a bag and vacuuming out the air. Tomorrow I am going to make some of Dad’s favorite casserole with pork meat, onions, cabbage, and potatoes, and store portions in bags for the same reason – easy to warm meals while camping. Okay, it’s not exactly roughing it but it’s a lot easier at 6 AM and 26 degrees to let the microwave do the cooking! I also had another cool food idea for the trip (yes, I’m a “foodie”). This involves making little steak sandwiches with ciabatta bread, wrapping them in foil, and keeping them warm in the crockpot while driving and fishing. A small amount of moisture in the slow cooker will help keep the sandwiches warm and not dry out. That’s not all the cooking I’ve been doing today. 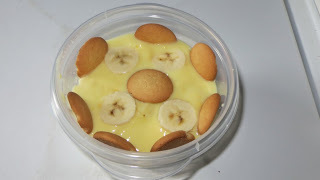 I also made a low sugar, banana coconut pudding. It’s a dessert recipe I came up with for a fun treat. It uses Greek yogurt to help mitigate the effects of the sugar in the Nilla Wafer cookies. This recipe is also on my other blog. It tastes too well to be healthy! The cleaning project at Dad’s house is going well. I’m at better than 95% of the way done with the main part of it. There will be more to do later this spring but the dumpster work is done for now. I have been sending Sis regular updates about how the cleaning was going and couldn’t help making a 24th century type video… Wouldn’t it be nice if cleaning was this easy? Dad is still pretty frail and rather than assisted living, he will have to reside in a nursing home which is just 10 blocks from the house (and my van). It looks like I will be continuing to live in the driveway and work on the house for quite some time to come. There will be a post later this week, depending on when I can get on the road… Tomorrow is the first trout stocking day… No April fooling about that! A friend of mine turned me onto them when I live in MN and I can’t live without one now. Aren’t they they best! I love the small amount of space required for the little vacuum pump. It can fit about anywhere in the van and do what I used to have a big electric machine for. So what do you use them for the most? Initially I was using them the same way I’ve always used zip lock bags. I seperated meat into meals sizes, and saved myself the aggravation of trying to hack a piece after it was frozen. I’ve drastically cut down my consumption of meat over this last year and mostly use them for veggies now. I have used/reused them with dried foods like beans and what not. They’ve really helped me from wasting food that’s gone bad the most. The camping trip sounds great. I guess you’re not going with the idea of only eating what you catch LOL. I’ve been gettin’ the van ready – even pulled out the passenger’s seat and replaced it with tote pans… It’s going to be a fun little trip.